Battle Girl is mid-battle with a group of low level Vicious Circle goons who had attempted to rob a bank, taking advantage over the fact that Malcolm Dragon is notably out of town. They are all swiftly defeated by Angel who notes that Chicago is still defended, by both her and a number of S.O.S. members that had remained in town following the wedding. Angel is bemused by why these non-powered funky headed freaks even bother with the crimes they commit as they inevitably fail and just end up in jail. Meanwhile in Hawaii, Malcolm and Maxine are enjoying their honeymoon on a remote island where they are pleased to have encountered none of the monsters that legends say live there. The couple are enjoying married life together and talk about potential baby names along with how the device that Lorella created to protect Maxine seems to be working perfectly. The newlyweds go for a walk through a woodland but their peace is interrupted when a quartet of local gods emerge through the trees. They immediately attack Malcolm which causes a terrified Maxine to flee for her life. When one of the gods manages to get close to her, Maxine’s personal force-field activates and keeps her protected, launching her attacker into the distance. Malcolm recovers to take the fight back to the gods, destroying one of their heads to discover that it appears to be made of solid rock. Eventually the gods are able to overwhelm Malcolm and render him unconscious. They gather both him and the bubble-encased Maxine up and begin to walk across the island. Maxine attempts to learn the motivation behind their abduction but cannot get any of her captors to speak to her. They ultimately end up near a mountain where it is revealed that the gods are actually merely statues created and animated by the villainess Virago. Virago explains that she has exploited local legends to her own advantage, luring curious visitors to her lair so that she could drain them of their life-forces. These murders have enabled her to remain alive, the rituals having actually allowing her to live for centuries. 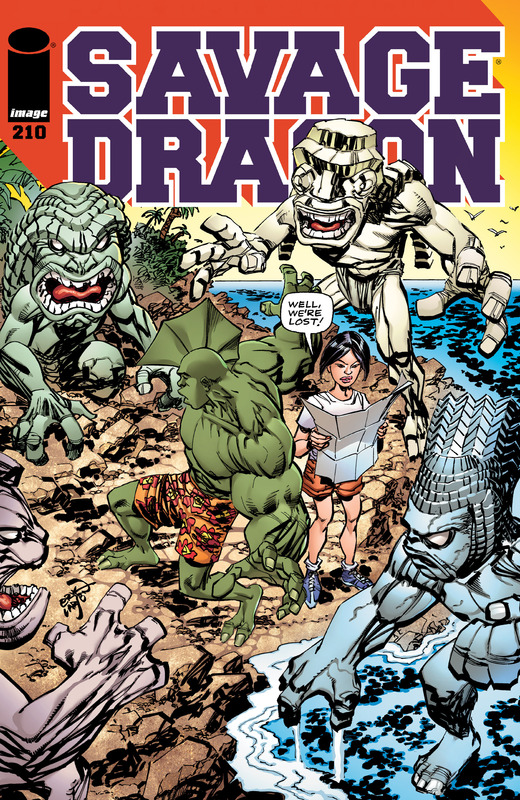 Virago notices the similarities between Malcolm and her former foe, the Dragon. She has her god statues prepare the ritual that will transfer her captives’ life-forces to her. The trio of PowerHouse, Fever and Flash Mercury have tracked down the werewolf that they have been hunting for a while now. They approach his lair but just as they prepare to make their move, the Deadly Duo burst onto the scene. The new arrivals wrongly assume that the trio are responsible for the attacks upon innocent civilians. PowerHouse recognizes their assailants and dismisses their threat as a relatively minor one. the snake’s venom and believes that all three of his opponents are true monsters. PowerHouse directs the Kid Avenger into the path of Flash who punches him down to the ground. As the drugged Kill-Cat continues to panic, the werewolf enters the fray by attacking them all. The heroes for hire leap into action and have soon overpowered their target. As they depart to claim the bounty on the werewolf, Kid Avenger struggles to regain consciousness. Kill-Cat is left cowering up against a dumpster, hoping to be left alone by the various “monsters”.